Symposium V, 'Harnessing Instabilities in Soft Material Films and Interfaces', Symposium NN, 'Biomineralization and Bioinspired Inorganic and Inorganic/Organic Materials', Symposium OO, 'Multiscale Mechanics of Hierarchical Biological, Bioinspired, and Biomedical Materials', and Symposium PP, 'Materials and Sensors for Biomedical Applications', were held Nov. 29–Dec. 3 at the 2010 MRS Fall Meeting in Boston, Massachusetts. This volume contains the joint proceedings based on these four symposia. 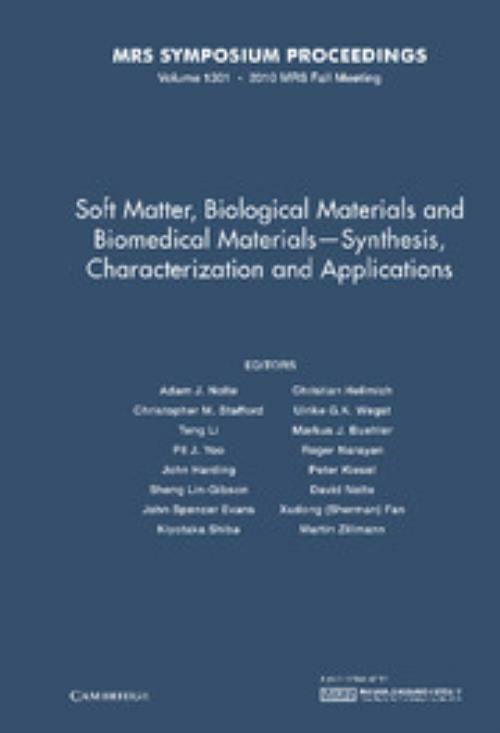 Although organized by separate teams of scientific and engineering researchers, these symposia explore a common theme of how biological and soft material properties may be harnessed to build new structural features or elicit useful structural responses, either to understand the fundamental chemistry and mechanical principles or to design practical sensors and metrology tools. Challenges in this field are best addressed by interdisciplinary collaborations and communication between various science and engineering disciplines. Building such collaborations was a primary goal of all of the symposia represented in this volume. Part IV - Materials and Sensors for Biomedical Applications. Christopher M. Stafford National Institute of Standards and Technology, Maryland. Teng Li University of Maryland, Baltimore. Pil J. Yoo Sungkyunkwan University, Seoul. John Harding University of Sheffield. Sheng Lin-Gibson National Institute of Standards and Technology, Maryland. John Spencer Evans New York University. Ulrike G. K. Wegst Drexel University, Philadelphia. Markus J. Buehler Massachusetts Institute of Technology. Roger Narayan University of North Carolina, Chapel Hill. David Nolte Purdue University, Indiana. Xudong Fan University of Michigan, Ann Arbor.